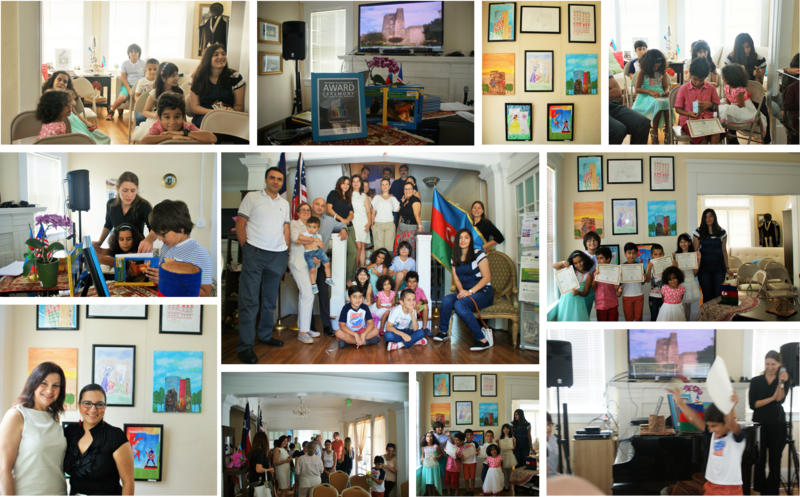 We were blown away by the creative spirit displayed by our youth through their interpretations of the renowned Maiden Tower as part of the “The Maiden Tower through your eyes – Children’s Art Contest,” held in collaboration with the Azerbaijan American Cultural Alliance and the Azerbaijan Center. Known as “the most majestic and mysterious monument of Baku,” 11 bold participants wowed the judges with their unique interpretations of the tower and were celebrated at the awards ceremony held June 20, 2015 at the Azerbaijan Center. Mrs. Emmanuelle Hamilton, Director of Marketing and Communications of the Azerbaijan Center, opened the ceremony by welcoming the participants and their families before introducing Mrs. Irada Akhoundova, CEO of the Azerbaijan Center and President of the Houston-Baku Sister City Association. Mrs. Akhoundova elaborated on the importance of culture and youth among the Azerbaijani community and pointed out how this contest allowed the children to express their own ideas and perceptions of their cultural identity. Mr. Ismayil Ehmedov, President of AACA, also talked about the distinct connection between the artwork and the Azerbaijani culture and expressed his pride and admiration for the variety of artwork that was created. A panel of three judges was selected from outside the Azerbaijan community and together they critiqued the entries based on: interpretation and clarity of the theme, creativity and originality of the depicted theme, quality of artistic composition and overall design and overall impression of the artwork. The winners Zahra Ali (First Place), Zarifa Aliyeva (Second Place) and Ujal Ali (Third Place), were praised for making thought provoking connections between the Azerbaijani and American mythologies, effectively illustrating powerful historical elements in Azerbaijani culture and visually and thematically integrating the beloved Azerbaijani love story with the Maiden Tower. The winners were awarded gift cards from Barnes & Noble and each participant received a certificate of participation, a free ticket to the Houston Zoo and the exciting opportunity to present their artwork in front of the audience. The Houston-Baku Sister City Association would like to especially thank the organizing committee, Mr. Ismayil Ehmedov, Mrs. Saida Fagala and the children’s art teacher Mrs. Parvina Aliyeva, responsible for the talent that was demonstrated by the participating children. Both Mrs. Aliyeva and Mrs. Fagala were present at the ceremony and expressed their respect for the children’s artistic skills and their dedication to the project. We would like to express our gratitude to the judges for dedicating some of their time to this project and for their enthusiasm. We would also like to extend thanks to our partners on this project, the Azerbaijanian American Cultural Alliance, the Azerbaijan Center and to the Azerbaijan community here in Houston that makes events such as these a great success. Stay tuned for the next art contest!